I posted a 128kbps LP rip of this incredible album from Brasil over at Ish's april want list update a little while ago, and Simon, whose blog is looking so damn good!, soon posted a 320kbps rip with scans from the Japanese import CD. Then, he gave me the honor of posting his rip here. Simon and I are thousands of miles away from each other, but we're shaking hands right now. That's what it's all about! 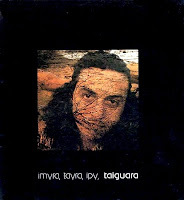 imyra, tayra, ipy, taiguara was released on Odeon in 1976, and almost immediately pulled from the stores by the censors because the lyrics in general are very political, very critical of the military government. I'm working on a translation of the album (this will include some biographical information) and will post the translations when finished. Here's the tracklist with musician credits. Everybody involved in this album is a total genius! I might have translated the credits incorrectly in one or two places. The link follows. arrangemen, flute solo: Hermeto Pascoal; piano solo: Taiguara; tenor sax solo: Nivaldo Ornellas; idéia de base (basic rhythm section arrangement? ): Taiguara, Novelli, Toninho Horta; coro: Lucinha, Eva, Marisinha, Mlu, Novelli, Wagner, Nivaldo. as i said in the mail , no problem, and thanks for showing me this wonderful album in the first place. Best wishes to you, too, Simon! Say, you're right. I like this a lot. What an eccentric beauty. Thank you. fantastic LP thank you so much! If we couldn't laugh, we'd all go insane. Could you please repost it ? The Most Beautiful Album In The World?